On Saturday September 30th we held our second annual 9-wicket singles tournament in Lee’s Summit MO, a suburb of Kansas City. A small core group of 9-wicket enthusiasts have been trying to expand our number of participants. Three of us have two full-size courts at home, another has recently built four full-size courts, and two more are in the beginning stages of building two full-size courts. Each of the group hosts about one tournament per year. This particular event is sponsored by Lee’s Summit Parks and Recreation. I approached them last year about providing some park area if I ran the event. This year, in keeping with the spirit of attracting new participants, we added a recreation division (beginner/intermediate). Some had expressed concerns last year about having to play with the more experienced players. Hopefully with some exposure we got from the local Lee’s Summit Journal both divisions will continue to grow in numbers. This year we had eight in the recreational division and sixteen in the competitive division. We had three round robin flights accumulating points for a total score. Then twelve in the semi-finals, and the top three in those two games went to the finals. This year Neighbor’s Café, a local restaurant, donated gift certificates as prizes. We very much appreciate their sponsorship. We also had 3 custom made mallets as prizes for the recreation division. Pictured below are the winners of each division. Matt Smith was the defending champion and came in second this year to Nick Zink, both from Warrensburg Mo. Sandy Greufe qualified for her first finals and came in 4 th place. 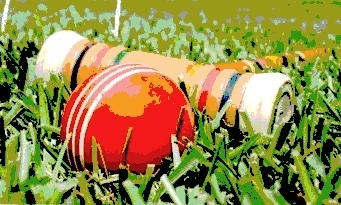 We are in fact in the planning stages of starting an area croquet club/association. 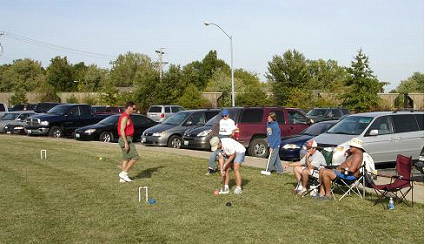 We also would like to approach the Lee’s Summit Parks board to build some croquet courts for us and the public to use. This is a pretty centralized location for many of our Kansas City area participants and regulars. Any suggestions from those of you who have experience forming a croquet club or proposing croquet courts to a parks board would be greatly appreciated. Anything we can do to promote our sport will definitely help the USCA. I can be reached at gregclouse11@yahoo.com.